The ranch is closed on Thanksgiving and Christmas. This 400-acre living ranch, named the Dog-Iron Ranch by Will, has longhorn cattle, goats, donkeys, horses, and a peacock. The centerpiece of the Ranch is the “White House on the Verdigris,” the home where Will Rogers was born. As you visit the house you can hear Will Rogers Jr. describe life on the Ranch. 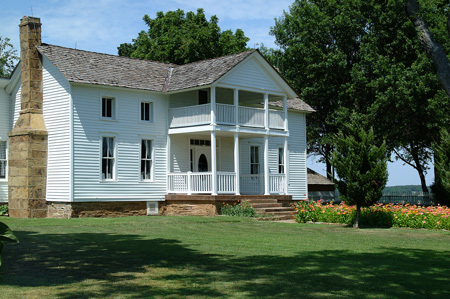 At the Birthplace Ranch you can stroll the grounds, see the room where Will Rogers was born, have a picnic lunch, and enjoy the wonderful view over Oologah Lake. To learn more about the life and influence of Will Rogers, visit the Will Rogers Memorial Museum in Claremore, Oklahoma. Find out more.